In our last blog post, special guest contributor, Andrew Dailey wrote about the 15 Signs You Need an Agile Monetization Platform. Today, we review early results from MGI Research’s survey of billing executives and experts to learn what are the biggest monetization challenges and technology trends facing business leaders. 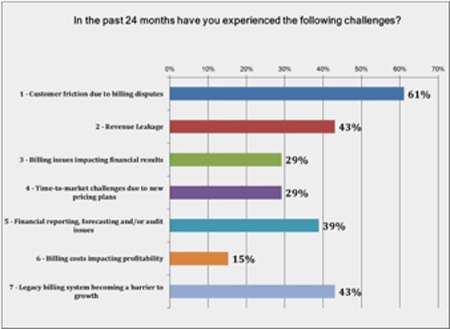 "What this shows, and the rest of the survey data supports this,” reports Igor Stenmark, Managing Director, MGI Research, "is that there are serious and durable business challenges that drive replacement of legacy billing systems with a new generation of agile monetization technology." This validates what we hear from our customers and prospects everyday. One of the biggest billing pain points for many companies is the amount of time and effort spent resolving customer billing disputes. During one of our implementations recently, we went through an exercise where we sat in the board room and passed around a typical customer invoice created through their old, legacy ERP system. Not one executive at the table, even those intimately familiar with the company’s product and offering catalog, could understand the cryptic coding system used to describe charges. No wonder their customer service reps were overwhelmed with client calls! Clear, easy to understand invoices are a critical customer touchpoint to improve customer experience and reduce overall churn. In addition to insights around monetization challenges, the survey also shows that true cloud (multi-tenant) solutions are overwhelming preferred. Early results show that cloud-based software is preferred by almost three quarters of survey respondents. This data clearly shows businesses prefer the many benefits of implementing cloud strategies. Cloud-based solutions are typically faster to launch than traditional, on-premise solutions and therefore speed up time-to-market. In addition to getting new offerings to market faster, cloud-based solutions with elastic design are ideal to scale business quickly, and turn capacity up or down agilely whenever service demands. The trend to pursue true cloud solutions also demonstrates how much more robust cloud-based systems have become. Advanced web hook and API availability within cloud solutions can be configured by IT and operations to integrate with existing legacy systems and extend the life of those systems. This inherent extensibility addresses another one of the top barriers to growth survey respondents identified. True-cloud based, multi-tenant solutions are another key to managing the agile monetization process for organizations in 2016 and beyond. These systems help companies solve complex monetization challenges by helping to better communicate critical billing details with their customers, reduce lost revenue due to inefficient processes, and grow revenue without being hindered by the lack of functionality in legacy systems. The full results of the 2016 State of Monetization Survey will be released later this month by MGI Research. Sign up for our newsletter below, and we will send you a note when it is available!